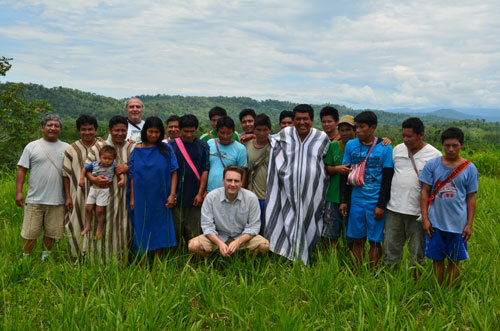 In 2008, like thousands of other Peruvian villages, Cutivireni village was offered a logging contract. Although the loggers offer only a fraction of what the trees are worth, when a village is poor, even a small sum can be accepted. But when cheaper trees are cut down to make new houses for the village, the villagers end up in debt to the loggers and are forced to plant coca on cleared land to pay these debts. Before long the whole community is completely controlled by organised crime. Cutivireni didn’t want this to happen so the villagers contacted Cool Earth for help. The charity fundraised to match the loggers’ offer and offered the villagers half then and half in a year. The villagers spent the money on a solar dryer which improved their cacao harvest and boosted their income. After five years there is now 153,536 acres of Ashininka forest immune to loggers’ overtures, with a further 1.4 million acres behind this shield inaccessible too. In the wider region, the average loss of canopy cover over five years was 29 per cent; in Cool Earth communities this loss was just 3 per cent. The project has supported 2,900 people over an area of 621km2. Within that area incomes have risen by 70 per cent. Since Cool Earth was founded in 2007, over 500,000 acres of rainforest worldwide has been saved and a further 4.1 million acres shielded. Some 35,500 indigenous people have been supported.